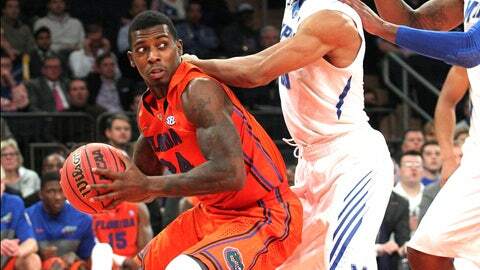 Senior forward Casey Prather tallied a game-high 22 points, scoring the Florida Gators' final eight in their 77-75 win over the Memphis Tigers. NEW YORK — Memphis had guards. Crazy good and athletic guards capable of wreaking all sorts of havoc, especially off turnovers and in transition. That was the pre-game message of the Florida coaches and they made it the emphasis heading into the Tuesday’s nightcap of the Jimmy V Classic. Talking about it, though, can only work so much. By the time the Gators figured that out, they were in a dogfight at Madison Square Garden that went down to the wire. That’s when UF’s players leaned on another message the coaches have hammered home this season. The one about leaving the previous possessions behind — good and bad — and playing the next one. In this case, the last one. Tigers guard Joe Jackson’s drive for the game-tying basket in the closing seconds found a wall of Gator defenders. His shot hit the rim, was tipped in the air, then batted to halfcourt by UF forward Dorian Finney-Smith as the horn sounded to give 16th-ranked Florida a nerve-racking 77-75 victory over No. 15 Memphis at the world’s most famous sports arena. Senior forward Casey Prather tallied a game-high 22 points, scoring his team’s final eight, while Finney-Smith chipped in 14 points, six rebounds and three assists as the Gators (8-2) managed to defeat a second straight ranked opponent — UF defeated Kansas a week earlier — despite some sloppy halfcourt offense and a season-high 17 turnovers. UF may have shot 52 percent for the game and pummeled Memphis (7-2) on the glass, 37-26, but carelessness with the ball, coupled with the Tigers’ ability to convert 23 points off those turnovers, found the Gators in a hauntingly familiar spot to where they were 15 days earlier in another Northeast venue. The Gators, though, did not relive it. Prather’s scoring spree began with 3:14 to go and ended with two clutch free throws with 27 seconds left for a four-point lead. That margin was quickly cut in half by a basket from UM forward Shaq Goodwin with 19 seconds remaining. Memphis fouled senior point guard Scottie Wilbekin (11 points, 5 rebounds, 3 assists) on the inbounds pass with 17 seconds left, sending him to the line with a chance to push the lead back to four. Instead, Wilbekin bounced the front end of a one-and-one, the Tigers (7-2) rebounded and called timeout to set up a game-tying or winning shot. There was no doubt the play was going to begin — and likely end — with guard Joe Jackson (17 points, five assists in playing the entire 40 minutes), who had given UF’s best on-ball defender, Wilbekin, fits all night. He opted for Door No. 2, but Gators were everywhere. Jackson’s shot was short and with hands chasing the ball, Wilbekin managed to tip it and keep it alive for Finney-Smith, who whacked far enough away for UF to survive. “I just tried to get a piece of it,” Finney-Smith said. He got more than that and it was plenty. The Gators can use another close call — they’re now 4-2 in games decided by single-digits after going 0-6 in such games last season — to go back and review how they allowed Memphis to dictate tempo. The Tigers, with their three- and four-guard lineups, came into the game forcing 17.8 turnovers per game, the ninth-best mark in the nation. They had Florida right on that number. UF opened a 12-point lead midway through the first half, but Memphis pressured UF’s guards — especially frustrating freshman backup point guard Kasey Hill — and flooded the passing lanes in storming back to take its first lead with just under three minutes to go in the first half. Florida led 41-38 at halftime, but Donovan’s message was about making possessions count and taking the fight to the Tigers. The game was tied five times in the second half and the lead changed four others. And when the Gators looked like they were on the verge of pulling away, up 69-61 with just under six minutes to go, the Tigers wouldn’t go away. Good thing Prather wouldn’t either. “I was just trying to be smart on offense and be as aggressive as I could,” he said. Three straight possessions, with his team clinging to a three-point lead, Prather scored to stretch things back to five; the first on a beautiful backdoor cut pass from Finney-Smith; then when Prather drove and put a layup off the glass under Goodwin’s big body; the next time on a pair of free throws. Goodwin followed by making one of two from the line, then after a UF miss Jackson’s driving layup made it a two-point game with 31 seconds showing. Prather’s two free throws four seconds later moved it back to four and made him 6-for-6 from the stripe for the night. Then came the two foul shots from Goodwin and a fantastic finish for Florida. Donovan opted for a straight-up man-to-man defense on the final possession and told his five defenders to set their jaws and grind one out the hard way. “This was a toughness game,” Pelphrey said. Also a really good one between two teams that will be heard from as the year goes on. Better yet, give the Gators the win.